This year, Sami Schalk, an assistant professor of Gender and Women’s Studies at the University of Wisconsin-Madison, will deliver a Conseula Francis Emerging Scholar Lecture on September 10, 2018. 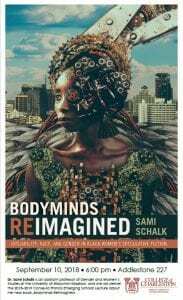 She published her book, Bodyminds Reimagined: (Dis)ability, Race, and Gender in Black Women’s Speculative Fiction with Duke University Press in 2018, and her lecture will draw upon the main arguments put forth in that project. Her research traces how black women’s speculative fiction complicates the understanding of bodyminds—the intertwinement of the mental and the physical—in the context of race, gender, and (dis)ability. 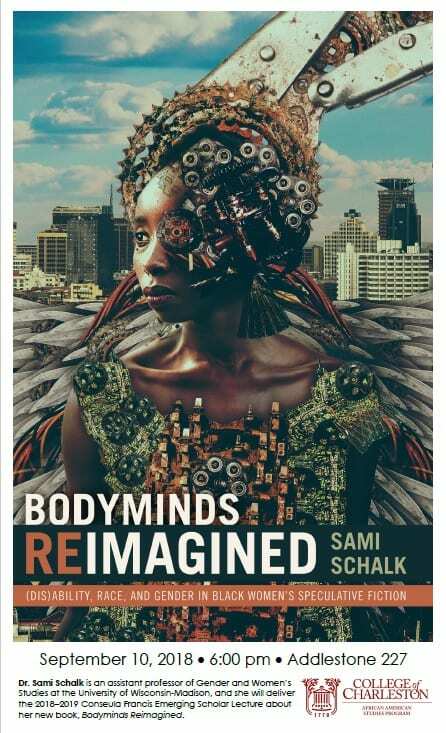 Bridging black feminist theory with disability studies, Professor Schalk demonstrates that this genre’s political potential lies in the authors’ creation of bodyminds that transcend reality’s limitations. Outlining (dis)ability’s centrality to speculative fiction, Schalk shows how these works open new social possibilities while changing conceptualization of identity and oppression through non-realist contexts. Her other publications include articles in Disability Studies, African American Review, Palimpsest, the Journal of Modern Literature, and the Journal of Popular Culture, among others. Professor Schalk’s lecture is titled “Black Women’s Speculative Fiction and the Deconstruction of Able-Mindedness” and will be held at 6:00 pm in Addlestone Library Room 227.